Maybe it's the sponge-like consistency that has you wondering about the nutritional value of tofu? Like—just how much protein, calories, fat, and nutrients can be packed inside? But really, this soy-based alternative to meat packs a serious punch when it comes to delivering on protein. And for those on a low-fat regimen, the fat ratio and calorie content of tofu can't be beaten. So—vegetarian or not—incorporate a little tofu into your weeknight dinners. The more tofu recipes you learn to cook, the less you'll be missing your meat. 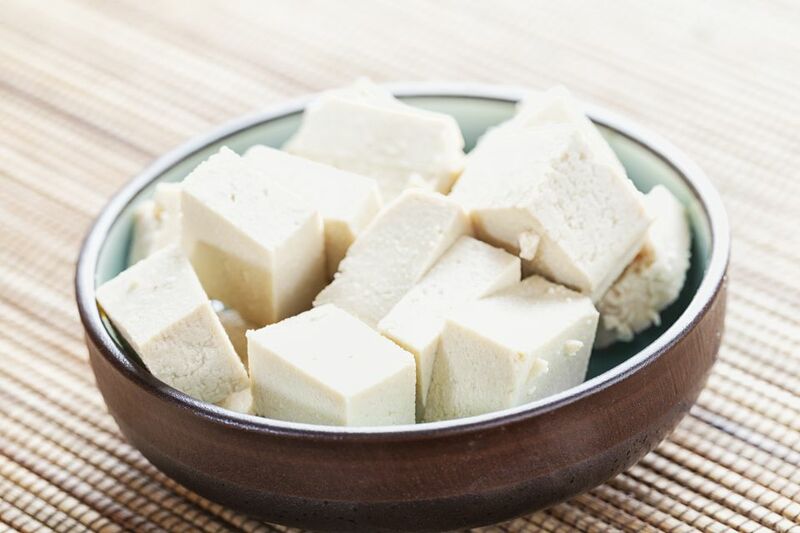 As a perfect source of vegetarian protein, one 1/2 cup serving of raw, firm tofu contains 10.1 grams of protein. Compare that to a 1/3 cup of milk (weighing in at 5.1 grams of protein), one 3-ounce egg (at 6 grams of protein), and 4 ounces of ground beef (at 26 grams of protein), and you have an excellent way to meet your recommended daily allowances (RDA). For instance, the daily recommended protein intake for most men is 56 grams, whereas most women need 46. So, eating just 1 cup of tofu gets you almost halfway there. No wonder it's a go-to for vegetarians and vegans alike. When compared to meat and cheese, tofu wins in the calorie department, as well. Tofu is low in calories (and fat), given the amount of protein it contains. For each 100 calorie serving, tofu has 11 grams of protein. By comparison, 100 calories of ground beef provide 8.9 grams of protein, and a 100-calorie serving of cheese contains 6.2 grams. Additionally, one 1/2 cup serving of raw, firm tofu contains 94 calories. Whereas 4 ounces of ground beef contains 331 calories and four ounces of cheese packs 320 calories. If you're upping your exercise game for the day, splurging on meat or cheese won't matter. However, for a mid-day work meal, tofu always wins. One 1/2 cup serving of raw, firm tofu contains only five grams of fat and its low-fat counterpart contains a whopping 1.5 grams. Also, since it's a plant-based food, tofu is cholesterol-free. Meat and eggs can't even come close to these measurements, as 4 ounces of beef packs 15 grams of fat and 113 milligrams of cholesterol and one egg contains 5.5 grams of fat and 187 milligrams of cholesterol. Due to practices in the soybean industry, almost every brand of tofu is now organic or non-GMO, meaning the bean itself was not cultivated with the use of harmful chemicals and the seed was not altered in any way. This is an important fact when looking at nutrition as a whole, as many GMO and conventional products don't pact the nutritional punch of organic varieties. As an added bonus, most organic and non-GMO tofu brands are the same price as conventionally produced tofu. So don't hesitate to go organic. In this instance, both your health (and your wallet) will thank you.